Does gender influence how you raise a child? It’s a time-honored threat: “Just wait ’til your father comes home!” But these days, some believe that old threat has been turned on its head. Today’s dads, they say, are more likely to be the permissive ones, too intent on having fun with their kids; leaving all that unpleasant discipline to mom. It’s the Disneyland dad syndrome, without the divorce. Author and parent educator Elizabeth Crary says she doesn’t believe that there are gender-specific styles of parenting. But the important thing, she says, is that parents often believe there are. “I think parents often generalize — men are that way; women are that way — out of personal experience rather than wide experience,” she says. Portia Gray, a Seattle mom and copresident of the PTA at Seattle’s Catharine Blaine K–8 School, says her husband, who works from home, likes to be the one to lay down the law. Gray looks back fondly on the unconditional love of her own dad and urges her husband to play that role for their 12-year-old daughter. “I tell him, ‘You need to just adore her; make her feel like the most special person in the world,’” she says. Gray and Dunbar agree that disciplining their children was more clear-cut when the kids were small—mostly a matter of teaching them to share and pick up their toys. 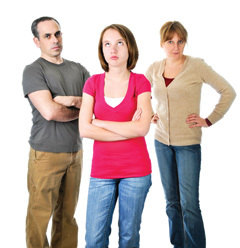 With preteens and teens, the issues are more complex and the possible consequences of “bad” behaviors are worrisome. Both moms recognize that they and their husbands have different approaches to discipline, and try to keep communication lines open. “But when it comes down to it and all hell is breaking loose, it’s tough to stick to your guns,” Gray says. Bollinger says the problem comes when one parent becomes resentful of the other for being too rigid or too lenient. If one parent overdisciplines and the other underdisciplines to make up for it, the issue becomes more and more divisive. She often counsels strict disciplinarians to back off and allow the other parent to step up to the plate.